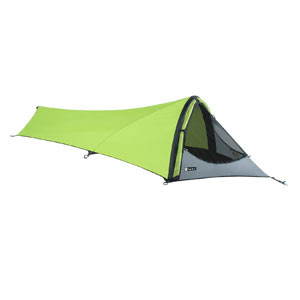 A versatile tent for any season! And its super light and easy to pack. Fast packing and solo traverses will never be the same. Gogo™ has revolutionized the world of bivys to include unprecedented flexibility and comfort. Gogo’s™ ExoFly™ front canopy creates a roomy interior with mesh for summer breezes and a vestibule for stormy weather. It also has the reengineered airbeam and the Integrated Pump to save weight. At 1.9 lbs, Gogo™ is the ultimate ultralight companion. « SRAM XO REAR DERAILLEUR DEAL! !